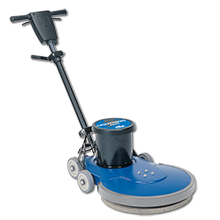 Improve floor appearance and save time with the Advolution 2710 Rider Burnisher from Advance. Burnishing more than 34,000 square feet per hour in open areas, the battery powered Advance Advolution 2710 reduces operator fatigue and increases productivity while creating an ultra high-gloss shine. It provides the shine of a propane burnisher without the emissions. The dust collection system effectively collects the dust and eliminates the need of dusting after burnishing. 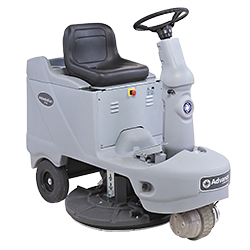 With no cords, no fumes, no emissions, no mess and an extremely quiet 1600-RPM motor, the Advance Advolution 2710 has a 3-hour minimum run time between recharging. Item#571143 Click here to view more burnishers. The Chariot iGloss is a high performance stand-on burnisher that features the maneuverability and productivity of a Chariot and adds simplicity with a new patent-pending spring-loaded weighted pad that eliminates user pad adjustment—just turn the knob and go. 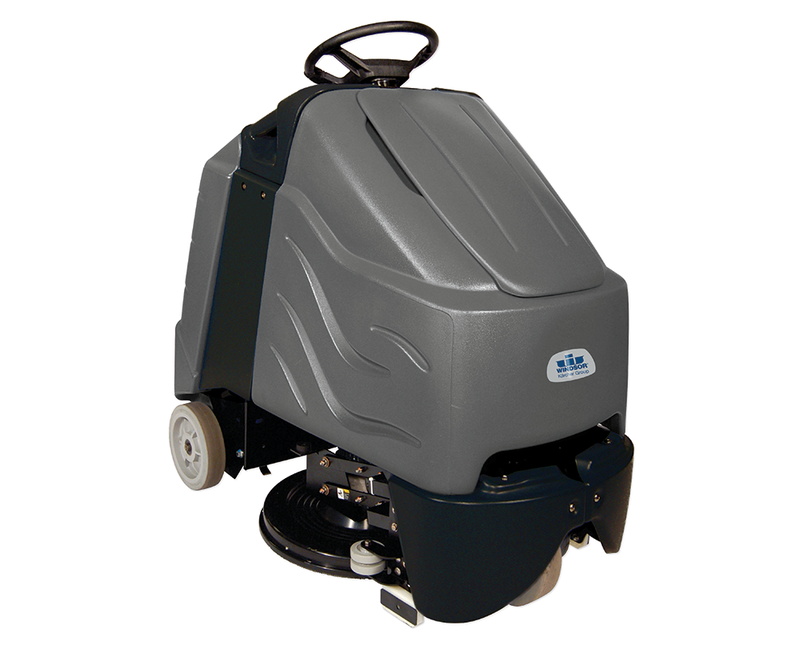 Some of the features of the Chariot 20" iGloss are: 20" cleaning path, 2000-RPM, no user pad adjustment. The design and size of the iGloss 20" provides remarkable maneuverability, and best-in-industry 360º visibility. It is battery operated for daytime cleaning. For ease of learning there is a simple, intuitive control panel. Low dbA (62 for active dust control, 59 for passive dust control) for day cleaning activities. It is available in active and passive dust control. Click here to view more burnishers. 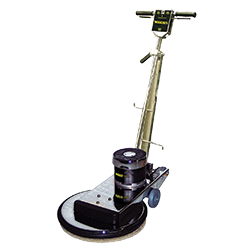 The NEW WAXIE 20" 1500-RPM is a durable, economical cord-electric burnisher that delivers unsurpassed value in high speed floor care. Includes a flexible, built-in pad driver for a smooth, balanced, and safe operation. The NEW WAXIE 20" burnisher is designed to give a “wet look” shine making floors look better and last longer. These machines are ideal for hospitals, retirement homes, schools and anywhere a high shine is needed. See specifications table for details. Item#571029 Click here to view more burnishers. Powerful, efficient burnishers quickly produce a brilliant shine. Flexible pad driver. Easy-to-use fully adjustable handle height system. Large 5" non-marking wheels for easy transport. Mechanical safety interlock to prevent accidental start-ups. Built in circuit breaker to protect motor. The rugged cast aluminum base and switch housing with non-marking bumper protects the machine and facility. The totally enclosed motor provides protection against dirt and debris, resulting in low maintenance.